Update April 10: Boss Key have changed Radical Heights’ founder’s pack – again. It is the second change since Cliff Bleszinski’s studio announced their new ’80s-themed battle royale only yesterday. A release time for the game has also been announced – 12:00 Eastern, or 17:00 BST. Check out the best free PC games. The release time later today was also revealed in the replies to that tweet, which also revealed that playable female characters “will be implemented,” but will not be available at launch. The founder’s pack originally included a $10,000 cash bonus, but this was removed in the first change yesterday. In the game, cash can be used to buy new weapons, or banked for use in later matches (see original story, below). 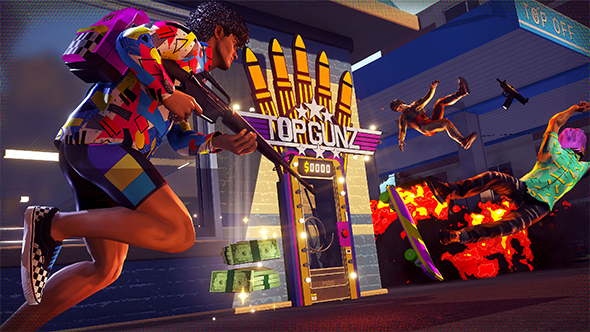 Radical Heights is all about cash, letting you earn money in each match that can be spent on weapons, or banked in an “Offshore Account.” Banked cash can either be spent on cosmetics, or withdrawn in subsequent matches to get weapons early. The game’s premium currency only nets you new cosmetics, but there is one notable purchase with the Founder’s Pack. The $14.99 purchase features an array of cosmetic items and other in-game bonuses, but the more controversial inclusions were $10,000 of in-game cash and a permanent 10% boost to all cash earned, causing concerns that players purchasing that pack would have a significantly easier time in-match. Boss Key have removed the $10,000 bonus, though the boost is still part of the pack. The developers say that the 10% boost applies only to the cash you bank at the end of a match. That means paying players will have more cash to withdraw in-game over time, but emphasize that making use of those withdrawals will leave you highly vulnerable to a shot in the back. The Founder’s Pack still includes 1,200 Rad Gems – the game’s premium currency – which can be spent exclusively on cosmetic items.